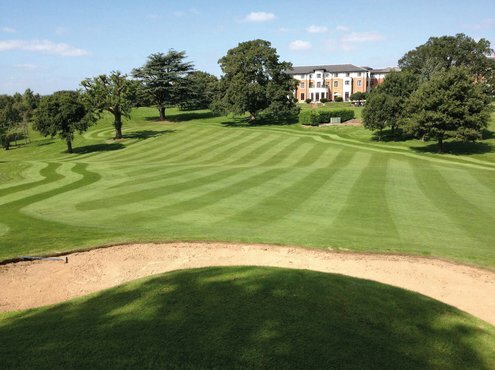 Naturally, the course here at Hilton Puckrup Hall is split into two profiles by the road which intersects it. There are nine holes on one side and nine on the other. One side is constructed on land high in sand and gravel content but, on the back 9, some holes are clay-based. There is no noticeable difference in playability, although the clay-based half retains more moisture and, therefore, did not burn off as much during the hot summer that we witnessed. We've done extensive drainage work over the last few years, including digging large ditches. We also mole bored a sixteen inch solid pipe right under the road, to link the wet area of the back nine of the course to the lake system, located on the other side of the road. We've also done some gravel banding to link up existing drainage lines on some fairways. Previously, we could have a flash lake form on the 15th fairway, up to half an acre in size, and that would take days to drain. Since the link, no water has held there at all. We've been open when we would have once had to shut this hole for about a week. If we were to isolate any points for development in the coming years, it would be to add to that drainage success. We'd implement more drainage over the four holes closest to the 15th fairway, and have the infiltration rates uniform across the course. We harvest our water for irrigation during the winter months and store it in our lake system. During the summer that we have just had the course baked hard, there was some thinning of turf on all areas, but we were out hand-watering greens daily. 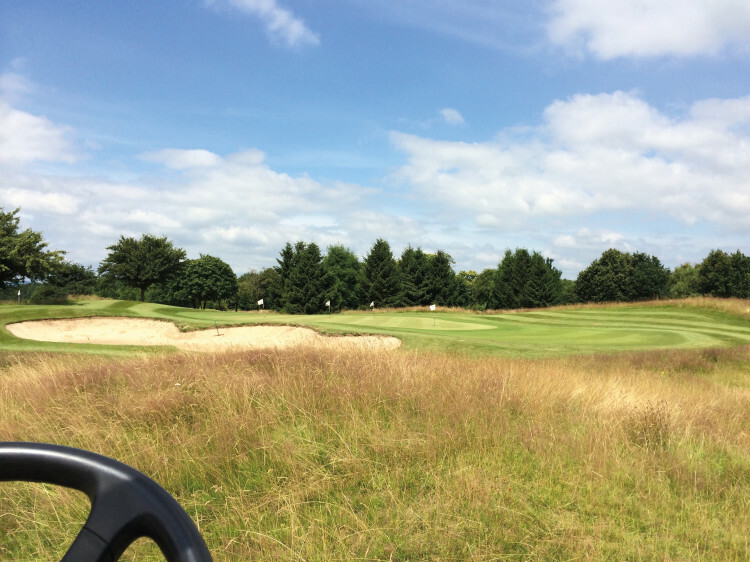 Hand watering became essential for us due to the prolonged dry spell of the summer as our water reserves became dangerously low and we had to prioritise areas for irrigation. Together with the use of wetting agents, we were able to just about keep on top of moisture levels on the greens, but I was glad to see the rains arrive in the autumn! The sward got a little bit thinner on the greens towards the end of the summer, due to high stress levels, so our focus over late summer/early autumn was definitely regaining that density as I knew that this autumn was going to be possibly the hardest that we have witnessed, disease pressure wise, due to chemical availability. 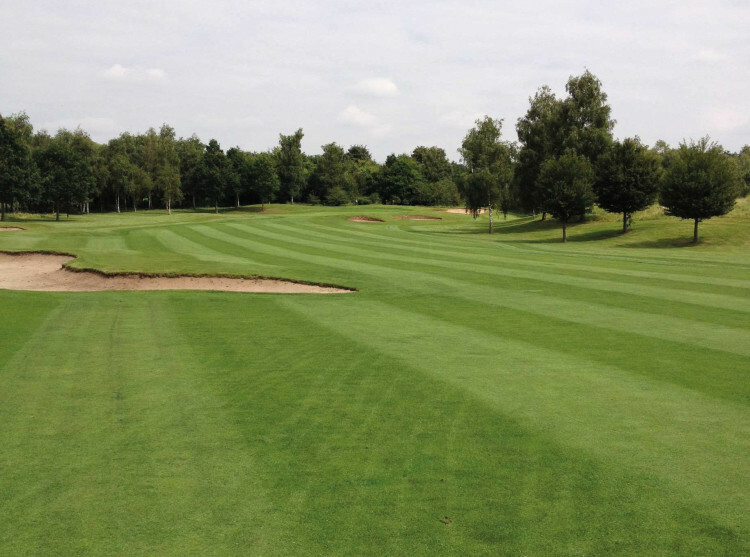 I'll continue by giving some background on our course's key characteristics, and those of our maintenance regimes. The bunkers here were built in the American style, with very steep faces. It's a test to keep the sand from pooling at the centres. I'd say that, even though bunkers are one of the most labour-intensive features of any course, it's particularly the case here. We use a coarse sand, with a slightly heavier particle size in the bunkers. That was in an attempt to have the heavier particles stick better with the faces and reduce sand migration. 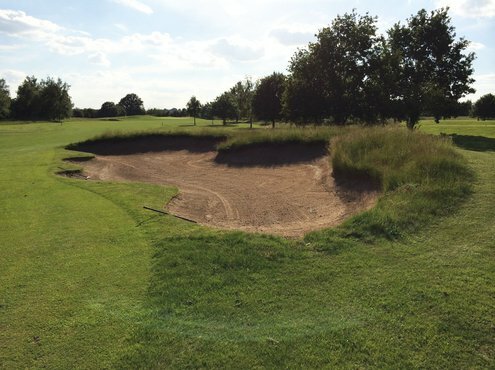 We've removed around 10-15% of the bunkers in the last decade that have become redundant due to technology and to reduce labour and maintenance requirements. That said, another feature of our course - the trees - are like painting the Forth Bridge: even when you've finished crown raising or thinning, you just have to go back to the first bit and start again. 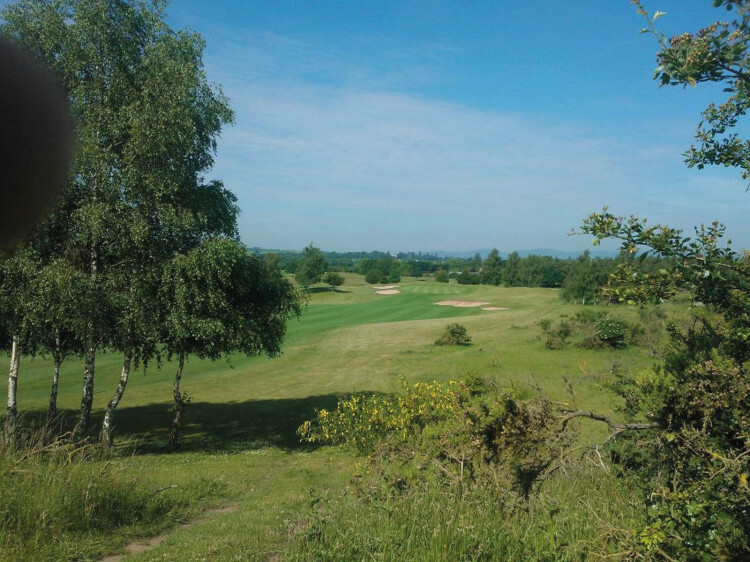 A lot of the mature trees on the course and hotel grounds are covered by TPOs and we have all trees externally surveyed bi-annually and have tree surgeons come in to carry out the suggested works. We refurbished all bunkers ourselves, about eight years ago. They were completely dug out, drains cleared and added to, bases lined with upside down turf, new pipes and stone added and finally filled with new sand and compacted. 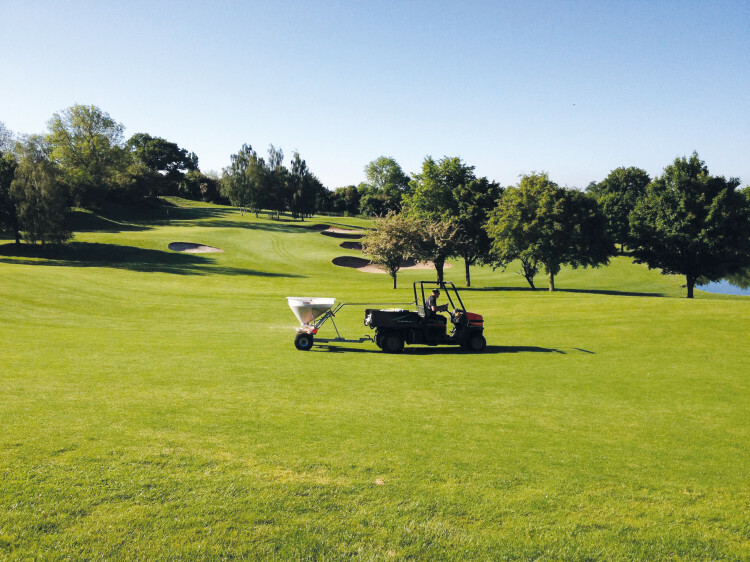 We top up any bunkers that require sand replenishment throughout the year. In the next year or two, I'll be completing my gauge on which company might be the best fit to update that base-layer technology, for our style of bunkers. Our greens are predominantly a mix of poa and bent and, of course, we're trying to introduce more bent incrementally. I visited the Netherlands last November with Ray Hunt (ALS) and Matt Gresty (Limagrain) to look at and discuss products that they had to offer, as I was keen to give them a try. We've gone with their all-bent mix. 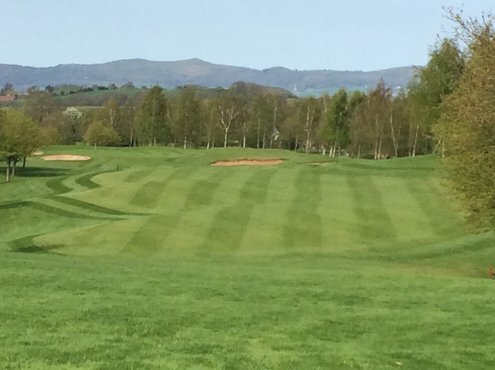 I met with Matt a few weeks ago to inform him that we'd got a great strike rate from our last overseeding as I was over the moon with the results that we achieved. That was really important after this summer, to help us recover from the heat stress. It integrated well, as we have a history of seeding with all-bent. We haven't overseeded the tees now for some years. I didn't think we needed to, as the sward was resiliently good across the board, but it is something that I will be looking to once again due to increased levels of golf we have witnessed over the last number of seasons. I'm not a big user of the stimpmeter - I prefer a putter- but our greens tend to run at between 9.5 and 11 year-round. I tend to avoid allowing them to get higher than that, unless it's for a specific event, as we have a wide selection of player handicaps that use the course, from members to corporate days or golf breaks, all of which are tested on what are already challenging greens (there are five MacKenzie-style greens). The recent removal of Iprodione I feel will be huge for us as an industry. Not having that safety net of a curative product to me will mean using new types of fungicides, more topdressing, more aeration through to November, and even more emphasis on the use of nutrients to produce a stronger plant at the end of summer, ensuring that the plant is a strong as possible heading into the notorious disease prone months. Timing the use of products is as important as product selection; using GDD data to predict when you'll get the most bang for your buck. That's now a much more important factor when planning feed and fungicide programmes. I tend to have my soil samples done in the same week each January, because my feed tends not to change much year-on-year, and I feel this gives a better indication of what we have in the profile. Barring difficult weather conditions, I know that the nutrient levels and pH will be similar to the same time the previous year, so I can monitor those and the organic material reliably. That January information will guide my March and October operations, which will include OM control. Going back to disease management, I use a 5:2:10 fertiliser around early September (a bit earlier this year to negate the stress following the difficult summer) to focus on strength. Probably 80% of my feed is liquid-based, and we spoon-feed every ten to fourteen days. I find it easier to tailor to both weather and golfing requirements that way. We used to spray every thirty days, roughly, and we'd get to the end of the cycle and find that the coverage was less than we'd hoped - whether that's feed, bio-stimulant, wetting agent, or whatever - so we decided to halve the rate and double the applications. It improves timing and coverage. The course is twenty-five years old, and was built a few years before I started working at PHGC. I knew, upon arrival, that there were problems with infiltration on certain greens from working with the course manager at the time whilst trying to learn about the site. There were three problem greens (two were completely rebuilt soon after the course was opened) and the remaining green has been our focus for additional verti-draining, additional topdressing and drainage to the perimeter. This green had developed a hard pan just above the gravel carpet, restricting water reaching the drains, so I brought in an Air2G2 to break that up and bring it up to speed with the rest. That worked well as we could really focus on a specific depth of the rootzone. We also bought a pedestrian aerator two seasons ago. That's out at least monthly, using various tines and depths. Its ease of use, versatility and ability to give us access to tight areas of the course is superb and has made a huge difference to our aeration regimes across all areas of the course. We core greens in March and early October, to integrate as much straight-sand as possible into the profile. 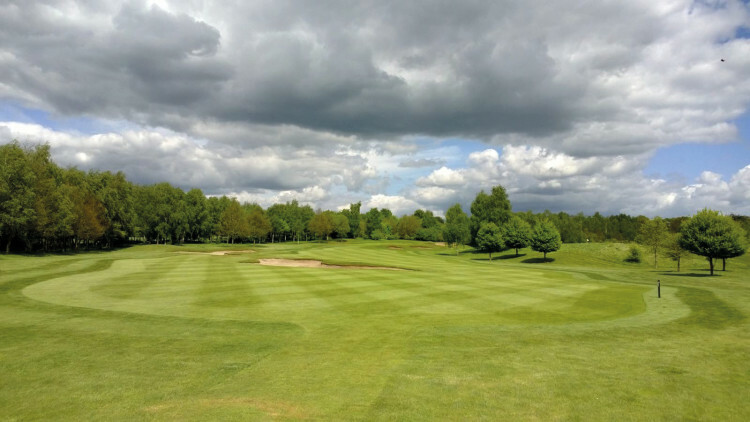 As I say, I've worked here for twenty-one years, played for even longer, and my team and I know the course like the back of our hands, which is invaluable when it comes to planning projects or knowing how the site will react to certain weather conditions. My grandfather and family owned some of the lands bordering the course, right off the second tee, so the land around here is basically my home turf. 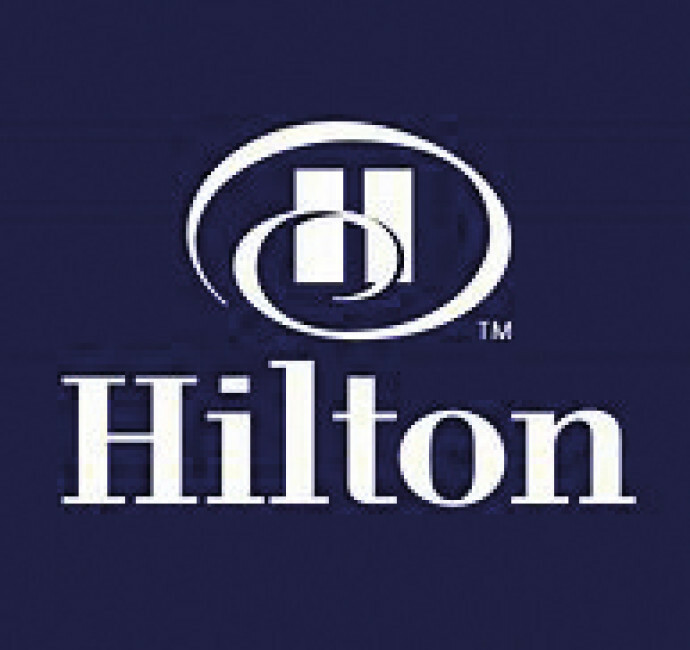 Hilton Hotels took over the course around 1999, when they acquired the previous owner, which was a Scottish hotel chain. 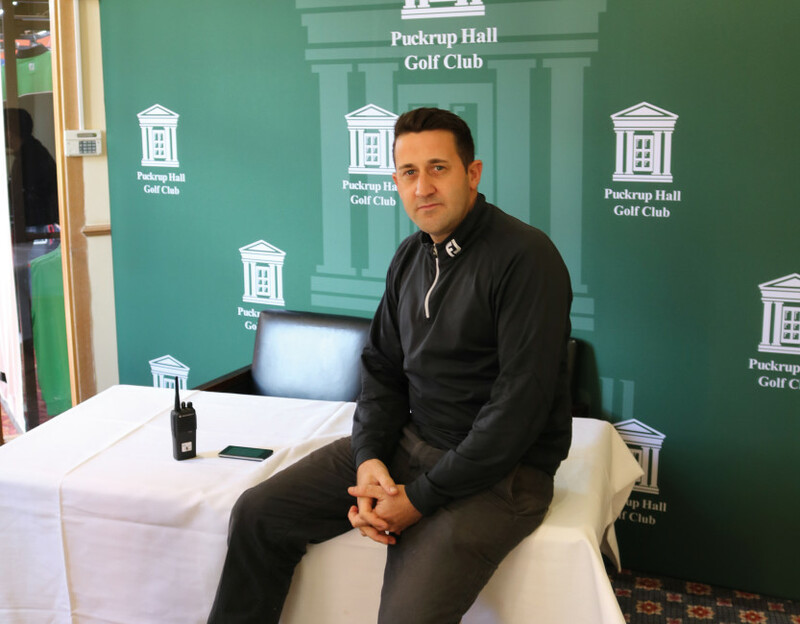 This resulted in more investment in both the hotel and golf facilities and having one of the biggest hotel chains in the world has really helped to develop and progress the course over the years. I'd like to give a shout-out to my hard-working full-time team: Jim Hughes, my deputy; Kevin Wilkins, senior greenkeeper; as well as Phil Richardson and Lewis Grey, assistant greenkeepers and Ashley Maine, Gardener, as well as the whole golf team here at PHGC as it really is a team effort. We tend to start our days around 6.00-6.30am during the summer months and 7.00-7.30am during the winter months. 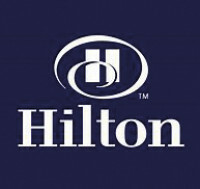 There are some tasks which could be done earlier, but this is a luxury hotel, so we're restricted to not using noisy, powered machinery early in the morning, too close to the hotel. We're pleased with all of these superb results we've been getting. 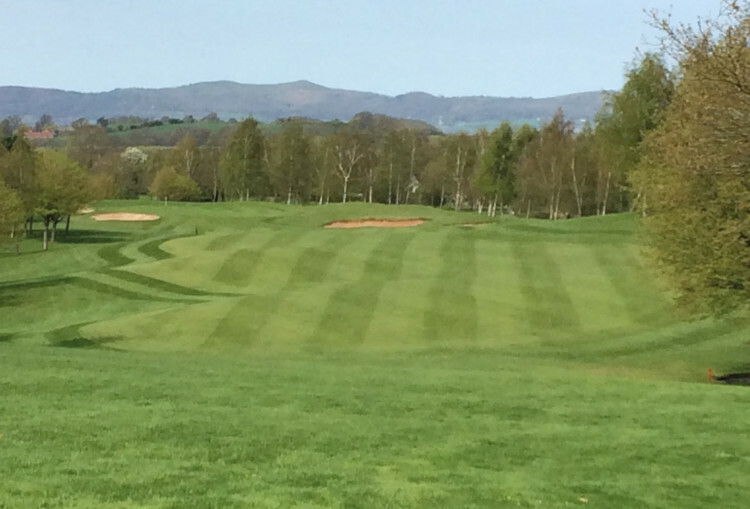 We've tackled those problem greens, and poorly draining fairways and the course just keeps getting better, year after year." Selection of strimmers, Flymos, chainsaws, blowers, pole pruners etc.